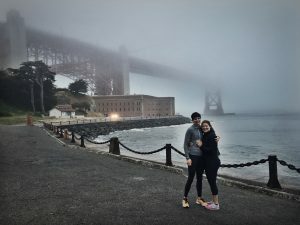 Engagement on a foggy day - Leber Jeweler Inc.
San Francisco’s Golden Gate Bridge makes a delightful background for Rachel and Laura’s engagement photo. Congratulations you two! We’re thrilled the Earthwise Jewelry custom-designed ring was a hit and we’re honored to be a small part of the big proposal. Plus, compliments to the errant old fisherman you found hanging out by the waterfront to take this great photo. He certainly has an eye for composition.